Emulsions, Suspensions, Creams, Powders, Granules, Gels etc. DTL has a range of custom-made glass diffusion cells that have been designed for dermal absorption studies with complex products. 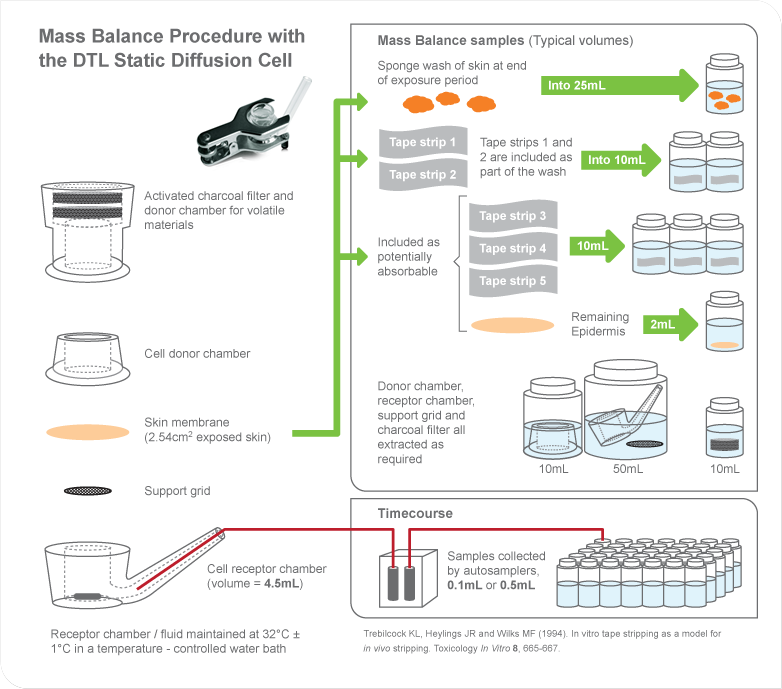 This includes filter trapping devices for mass balance recovery of volatile chemicals, large cells for the application of mixtures containing insoluble particulate actives or formulations containing metals, and mini-diffusion cells for studying the transdermal delivery of biologics or nano-formulations of drugs. Read more. We offer a consultancy service in the area of dermal absorption, including preparation of bridging cases, design and interpretation of percutaneous absorption studies for submission to various Regulatory authorities, including EFSA and SCCS in the European Union and EPA/FDA in the USA. We can provide advice on all aspects of percutaneous absorption including study review and guideline interpretation.